Are you looking for a healthy dip to serve in a flash? 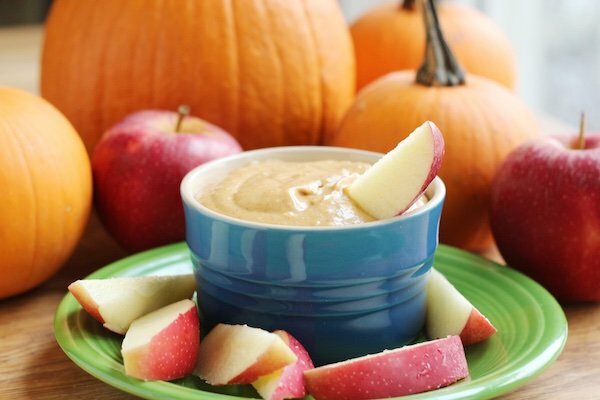 Look no further than this pumpkin dip for apples. Perhaps you are getting tired of everything pumpkin – but I’m not! This is one of my favorite recipes that I have come across (and revamped for Snack Girl) in a long time. I love it because it tastes like pumpkin pie and I don’t actually have to bake one – what is not to like? Unlike my pumpkin chia seed pudding you don’t need a blender. This is a great way to add more fruit to your diet during the heavy food season (take a look at my apple cranberry fruit salad if this is a goal for you). 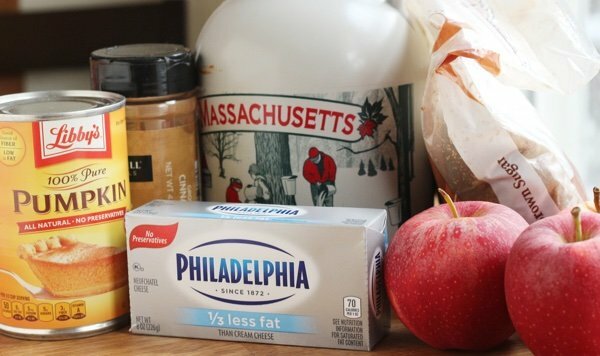 I bet you have most of the ingredients in your pantry already. 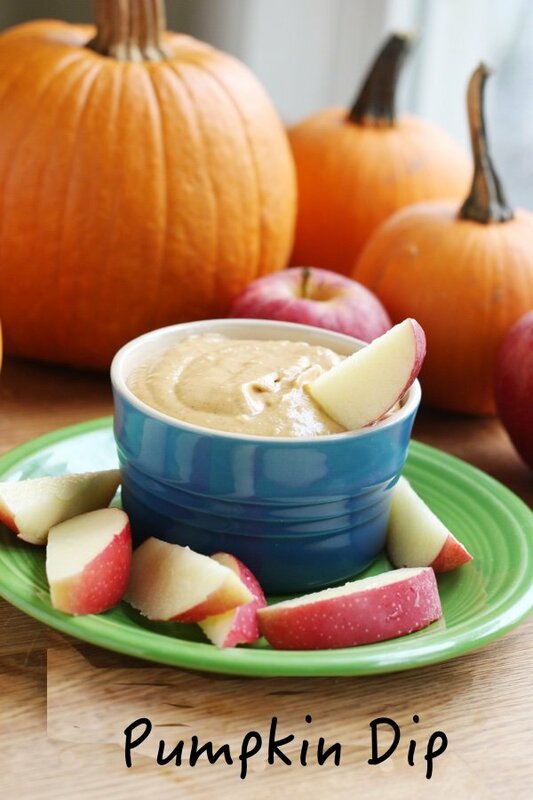 My kids ate four apples when I gave them this dip after school. My son did complain that there was no crust because he thought it tasted like pumpkin pie. Dips are a wonderful way to get people to eat more fruits and vegetables without them noticing that they are eating healthy. Dips are also represent some of the healthiest choices (not talking about cheese dip) when you look at appetizers. I love making dips because it looks like I actually made an effort (and I didn’t really cook anything). If you soften the cream cheese in your microwave, then you don’t have to use a mixer. I am all about using fewer things that I will have to clean later when I am cooking. If you are making this ahead, store in a tightly sealed container. Apple slices will get brown if cut ahead so treat them with some orange juice so they look great! Serve this as a dessert, a snack, or a way to get the kids off your back when you are trying to cook dinner. Doesn't that look easy? Who doesn't love to dip? Heat cream cheese in microwave for 20 seconds or until soft enough to mix well. Mix in sugar, pumpkin, maple syrup, and cinnamon. Serve immediately or chill in the refrigerator for later consumption. Eat with slices of apple. Lisa, I haven't made the Pumpkin Chia Pudding yet, but would it be a good dip also? I'm always looking for non-dairy snacks to add to the dairy ones so no one feels left out. Wow - this looks like it would actually be more decadent than pumpkin pie because of the cream cheese. Bonus - I do have all the ingredients on hand!!! Can't wait to try it! How many servings does this recipe make. It can't be just 1 serving, can it? @Roberta - this makes 1 1/2 cups or about 6 servings. Thanks for your question! @Pam - that will work! Thanks for your question. I've been making this dip for a couple weeks already I love it also as it is low calorie. I use fat-free sour cream a tablespoon of molasses and the maple syrup but no sugar and no cream cheese also I tend to use more pumpkin but the fun thing you can adjust the ratios I love your recipes! Even if I change them a little, your originals are what get me started and give me ideas.